Tropicana Field doesn’t have a lot of retro classic ballpark feel going for it, which is what makes the Tropicana Field Party Deck special. Sorry, forgot the sponsor, the GTE Financial Party Deck. Just a few rows to get to the all-important private concourse! 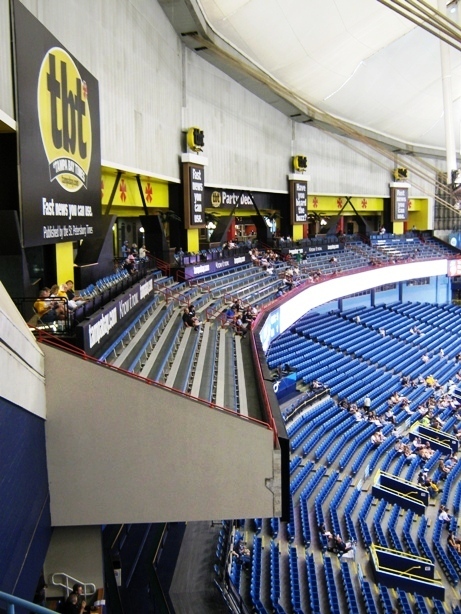 The Rays, like most teams in baseball, have to offer special enticements to get people to sit in the worst seats in the venue. 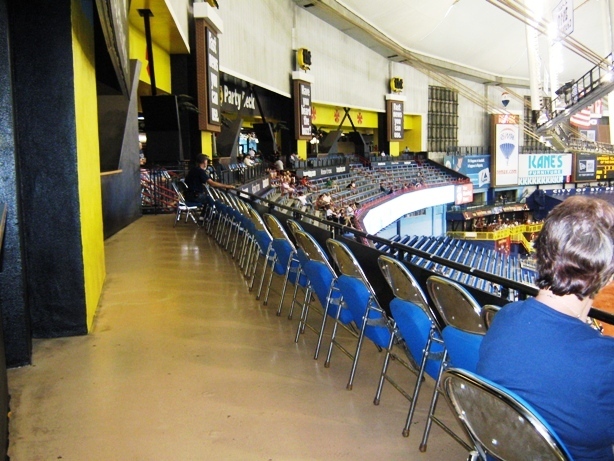 In this case those seats are in Party Deck, formerly known as the Beach. These seats are in the highest level in left field; imagine the view from the Green Monster seats at Fenway without the prestigious experience (or the prestigious cost!). Not to mention that they’re bench seats, great for touching cheeks with your neighbor. So what’s the advantage of the Party Deck? Well, they cost the same as the upper reserved tickets and are as such the cheapest seats in Tropicana Field. And being separate from the rest of the ballpark, chances are you won’t have to wait in line for your Cuban sandwich, always a plus. 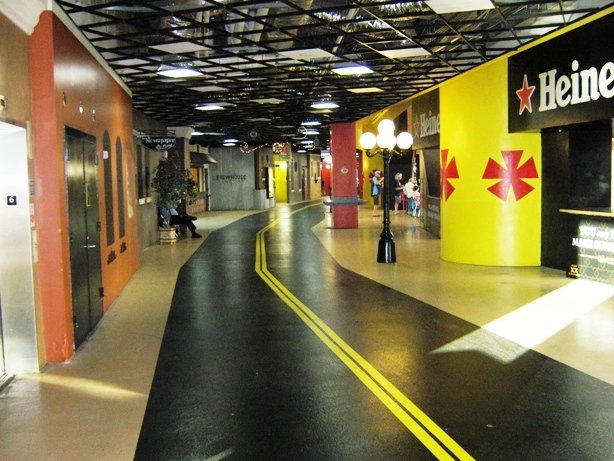 The Trop has colorful concourses. But it’s a very different atmosphere…the concourse area behind the Party Deck is designed like Ybor City, with bright colors, gas lamp style lights and concession stands like the Ybor Cantina selling Cuban sandwiches. The bench seats give the area a bleachers feel, as if you were channeling your inner Wrigley Bleacher Bum. In other words, the Tropicana Field Party Deck wouldn’t be the section of choice for most fans. But here’s what’s cool about baseball. You still see people sitting in there. There seems to be a sense of belonging here. In the same way that the super-royal-Legendary-Lexus box seats in the newer ballparks give people a sense of belonging to an exclusive club distinguished entirely by income level. Why pay $500 more to bond with someone, especially if they’re not even into baseball? It is, after all, still a ballgame. The exclusive and prestigious tbt* Party Deck, now sponsored by GTE Financial. No cell phone dwellers allowed. I know which group I’d rather hang out with, especially if I’m picking up the tab for my ticket. A smartphone addicted salesman who is still hashing out major deals in the top of the sixth of a one-run game with two men on is not my type of ballgame companion. College kids could go just about anywhere outdoors in Florida and have a better party atmosphere. People could network anywhere in the Ybor City area in Tampa or somewhere in downtown St. Petersburg. But for whatever reason, they’d rather go to a ballgame and sit miles away from the action in an indoor stadium with artificial turf. That’s my kind of fan.